Trevor Fry and the rest of Troop 146 of Quartz Hill worked two days at Horse Camp this weekend. I was there as well, and found a bunch of blowdowns along the trail. Here is a slideshow of photos. 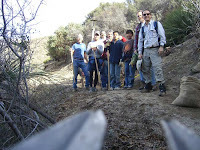 Was out with the High Desert Runners today for more brush-tossing in Dowd Canyon. We also replaced a signpost and did some treading. Here's a group photo (a mcleod did duty as a tripod) and a current status map. To date, 3.1 miles of the Spunky-Dowd area are now brushed. Pete and Co. will return in a few weeks for more. 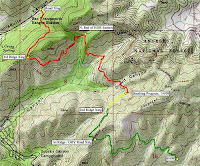 Congrats to all who have contributed to the progress in the High Desert Runners' adopted stretch of the PCT!